Two schemes carried out by Team Van Oord working on behalf of the Environment Agency feature in the latest edition of the Agency’s ‘Current’ magazine. The quarterly magazine highlights innovation and good practice in projects carried out on behalf of the Environment Agency, in a bid to encourage the Agency and its partners to ‘innovate, share and standardise’ the delivery of projects for communities. 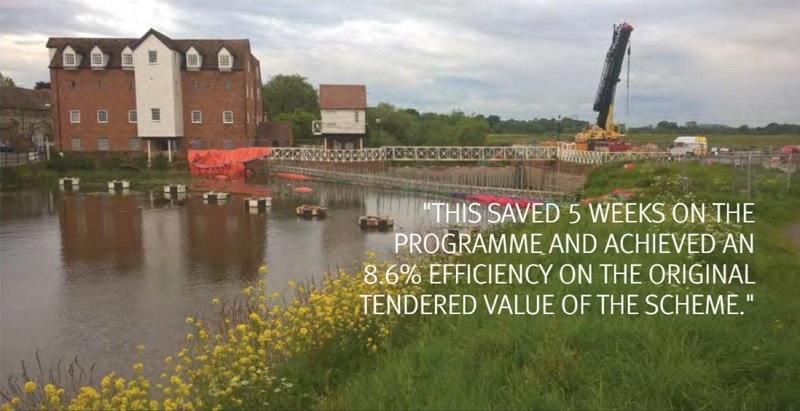 The sluice refurbishment at Abbey Mill – which in July 2016 became Team Van Oord’s first Environment Agency Midlands project – features on page 10 as part of the ‘Efficiency and Innovation’ section of the magazine. Abbey Mill Sluice is a fish belly gate within the Severn Ham SSSI, which controls water levels of the River Avon through Tewskesbury for navigation and flood risk management. The 17m sluice gate was installed in the mid-1990s and had failed its major operational inspection. Team Van Oord was commissioned to renovate the sluice under a design and build contract, with works now complete. In the article, Matt Figes, Team Van Oord’s Regional Framework Manager, explains how – after the working area had been de-watered – the site team cleaned and inspected the gate and then expressed concerns that removing it did not demonstrate best value. Instead, Team Van Oord proposed replacing the hinges and seals and then repainting the structure – in turn saving five weeks on the programme and achieving an 8.6% efficiency on the original tendered value of the scheme without changing the specification or design value. The July 2018 edition of Current also features the on-going Shoreham Adur Tidal Walls scheme (page 12) – in an article highlighting stakeholder success. Work at Shoreham began in October 2016, and when complete the scheme will significantly reduce flood risk to more than 2,300 properties in Shoreham and East Lancing, as well as protecting important local infrastructure including the road network, railway line and Shoreham Airport. The article highlights design modifications – including moving the 1,176 strong pile alignment half a metre inland so that the existing path and flood defence could remain in place to provide continual access for local residents. This plan required some land to be taken from the residents, so the Team Van Oord stakeholder engagement team met with the houseboat owners to explain the benefits. The article, written by Robert Pearson, Team Van Oord’s Contracts Manager, also explains how ‘stakeholder engagement has helped the project progress’ – while looking at innovations such as the ‘pile refusal protocol’. “Some residents told Team Van Oord that the existing embankment contained rocks and other obstructions that could hamper progress. The July 2018 edition also includes articles focusing on innovation, building information modelling (BIM), programming and safety, health, environment and wellbeing (SHE&W). The issue covers a number of projects carried out by Environment Agency Water and Environment Management (WEM) and National Cost Management Framework (NCMF2) partners, including Team Van Oord. The WEM Framework is a commercial agreement between the Environment Agency, consultants and contractors, with agreed terms for the award of individual contracts. It was signed in July 2013 and is a vital component in the Environment Agency’s ‘Sustainable Engineering Procurement Strategy’ (SEPS). Team Van Oord is a WEM Tier 1 supplier.